Reuben sandwiches are a favourite. 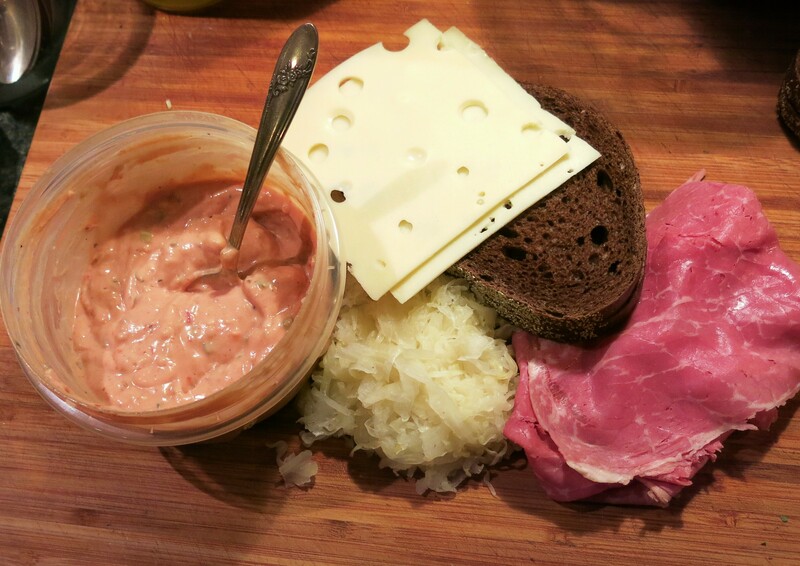 They are salty, meaty, with a hint of sweet from the Russian dressing and a hint of sharpness from the sauerkraut. Few places make a good Reuben sandwich. The good news is, they are very easy to make at home. 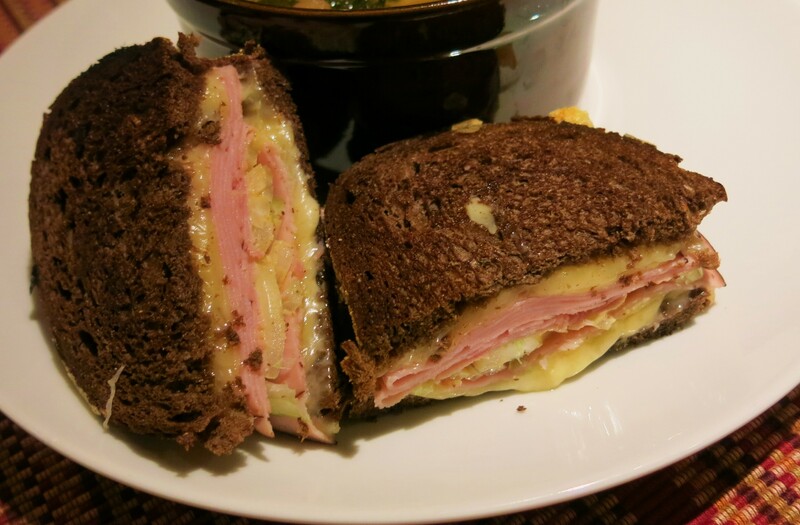 A Reuben sandwich is great with a vegetable soup or the Midwestern Cauliflower-Cheddar Soup. But they are great by themselves, though an order of fries is always tasty. This posting is for a dear friend of ours whose birthday is today; he loves Reuben sandwiches. This is for you, my friend…have a fantastically fun-filled day. 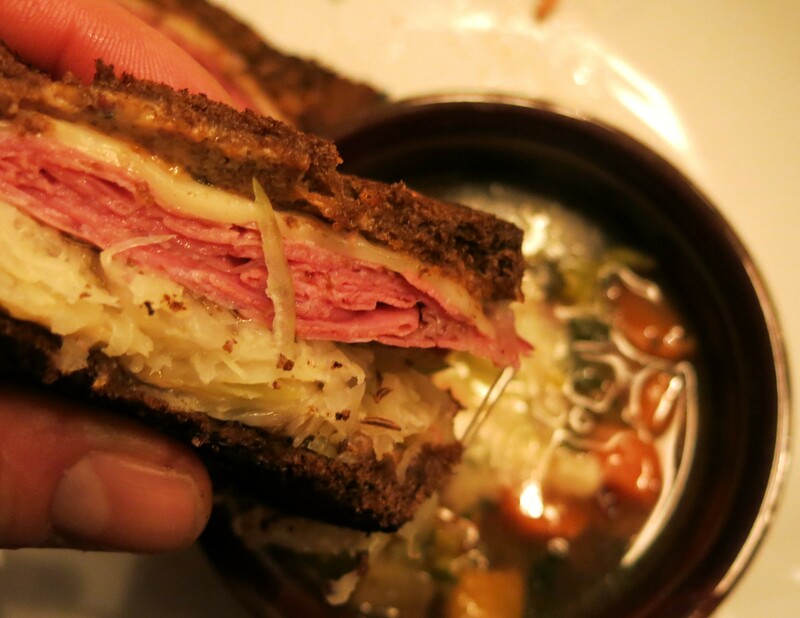 To make your own Reuben at home, first, you need good corned beef. I prefer to use leftover corned beef from St. Patty’s day, which I usually shred. But alas, we’re too early, so we may have to revisit this in March. I have a source for good, sliced corned beef at a local market, so that’s what I used here. Next, you want good sauerkraut, not too salty, and a nice, sharp flavor. You’re going to want to squeeze out as much liquid as possible, otherwise you’ll end up with a soggy sandwich. You can see in the above pic that the sauerkraut is nice and dry. I put the squeezed kraut on a piece of paper towelling to make certain I get it really dry. I chose an unseeded, dark bread. I love caraway seeds, but I really like this dark rye, so I tossed caraway seeds into the sauerkraut. Some good sliced Swiss cheese and finally, Russian dressing. I make my own dressing. It’s really a Thousand Island, rather than Russian, because it doesn’t contain beets. Also, I like to make at least a pint of dressing, so I don’t add chopped, hard-boiled egg, because I plan on keeping the dressing for at least a week, and hard-boiled eggs don’t have that long a shelf-life (or rather “fridge-life”). Here’s the dressing recipe. I’ve given you some latitude on the sweet relish and the honey. It all depends on how sweet you like your dressing. The Latin Lover likes it sweeter, and on a Reuben, so do I. We love this on salads and it does double-duty on a Reuben. If you wish to add beets, they do add a fantastic color, but I would rather add roasted beets to my salad and not to the dressing! Mix all ingredients until creamy and refrigerate until chilled. Use as a sauce for seafood, all types of salad, on Reuben sandwiches and burgers! This is best made ahead. Dressing can be stored in the refrigerator up to 10 days. NOTE: You can add 2-3 tablespoons finely chopped black olives and 1/2 teaspoon bell pepper flakes. Thousand Island Dressing Recipe©Marcia Lahens 2015. All rights reserved. Once you have the dressing done, (I don’t thin the dressing when I’m going to use it on sandwiches or burgers) slather some on both slices of bread, then you just put the sandwich all together, grill it over medium-low to low heat in a heavy skillet. I prefer cast iron; for cast iron you may want to use low heat. It will take about 2-3 minutes per side. I usually put a lid on the pan; it helps heat the sandwich through and get the cheese nice and melty. But be very careful not to burn the bread. Not a good thing…. This is a great soup and sandwich…uh, sandwich! I served this with Midwestern Cauliflower-Cheddar Soup. Dinner was fast, easy and tasty. Life is good…. LOW FAT MAYO!!!!!!!! Why not just use tofu! Good God woman Reubens aren’t freakin’ health food!! Better to saute the corned beef in bacon fat or use really fatty pastrami!!! Calm down…let me ‘splain. About tofu; we don’t use tofu because as Julia Child once said, “Tofu…hmmm…the food of the future!” I use Light mayo all the time and I doctor it up. I love mayo. Besides, I’m just checking to see if you were paying attention. I use the bacon fat to cook the sandwich in…. I’d add some diced red onion and sweet pickle relish to the Thousand Island Dressing. Absolutely. Those would be great additions.